Please go to Logan's page to read about what happened to this little Coatimundi "set free" in Albany, New York during the worst snowfall they had in years. Logan has a Best Nose Contest in the Blog - your vote counts! Logan has helped to find rescue for hundreds of orphan cousin coonies of his since he was rescued. Thanks Logan!! Please check the Blog to find out what's going on at the Raccoon Orphanage. Welcome back to the CoonCam Broadcast. In the arms of the angels fly away from here, from the dark cold hotel room and the endlessness that you fear. You were pulled from the wreckage of your silent reverie. You're in the arms of the angels may you find some comfort here. Visit Dory & the Orphans Blog to find out what's currently going on in the Coondos. When the sun is out between 9 am - 2 pm the chain link may glare and make viewing difficult. Click the refresh button to see the most current info. If you are unable to view the CoonCam, you might need to enable your java scripting by going to "tools" and "internet options". Click on the 'Advanced' tab and check if the java-scripting has a checkmark indicating it is enabled. Click the refresh button on top of your browser window to see the most current info. These three arrived in an Avon box. Somebody want to tell me how they got these three into an Avon box with a lid on it? Baby bunnies arrived 7/12/2007 approx 30 grams in weight. To be notified when new clips are uploaded, subscribe through the YouTube link. Enjoys these furrbutts - they're growing fast! Wish List Donations of these items always needed! Wildlife Rehabbers receive NO monetary compensation for their efforts from the DNR, BLM or any Federal or State Agencies. Expenses are all paid out of their own pocket. This includes medication, vet bills, X-rays, cages, housing, formula, food, release cages, intensive care facilities, time, trips to rescue critters, long distance phone charges to contact people that have found Wildlife, and anything necessary to help our Wildlife. If you'd care to donate any amount to help this cause please click on the donation button. Please be careful and courteous around your native wildlife this time of year. Their little families are important to our planet. Support your local Wildlife Rehabber. Guest Book - due to spammers guest book entries are manually added. Please be patient with me. 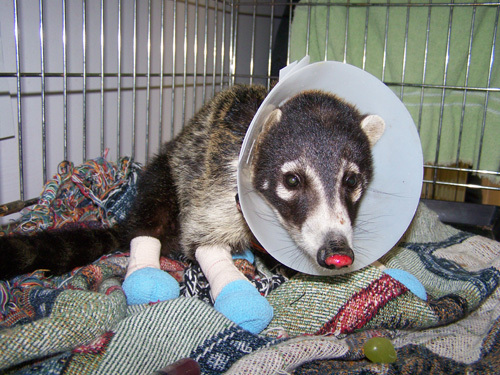 Be sure to click the refresh button for up to date info about Dory & the Orphans CoonCam. Currently live on the CoonCam in the Coondo. They have been joined by Kudos - a little fella who had an argument with a pickup truck. Kudos won but his sibling didn't make it here in time. Kudos to him for surviving! BUT - the little digital Kodak is getting old so these videos are getting a little choppy these days. The Crack Babies have joined Daisy in the Coondo. Daisy seems to be happy to have company again with her other peers having to leave her behind. They are all getting along great with each other. Little Butchy thinks he's the boss and half Daisy's size. Shamu has joined the orphans. Daisy is fitting in well with the others. She is happy to learn she's a coonie. 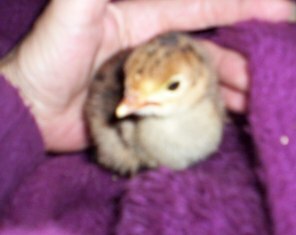 Daisy was brought to the Coondo. The 'crack babies' are now in the Mini-Coondo doing well. They have started solid foods and are growing like little weeds, climbing, and wrestling with each other. Arwyn has joined the Orphans. Your browser does not support inline frames or is currently configured not to display inline frames. This CoonCam made possible by William Ellick ... Thanks Bill!! July 5, 2008 Kelly Lake Sportsman's Club Fund Raiser was a great success! Thanks Sportsmen! !